Are social networks the future of present buying? Technology entrepreneur Farhad Koodoruth takes a look at Wishgenie to find out whether this is a flash in the pan or a long-term trend. Wishgenie is the 'social gifting platform' [yuck] that allows groups of friends to club together to buy gifts from a wide selection of well-known retailers. You can also create a wish list, and browse those of your friends to make sure you give the gifts your pals really want. The wish list can be set up across lots of stores giving a wide range of gifting options. All gifts and wish activity is then shared with friends across social media, giving highly viral results. Well, social gift-buying is a fast-growing online niche. From businesses like Wrapp, which lets you give free or paid-for gift cards to friends, to collaborative payments such as PaybyGroup, ventures are springing up all over the shop. And it's a pretty exciting space. Especially since Facebook acquired gift-giving app Karma for an estimated $80m. Like all good social businesses, I heard about this through friends. Anyone who likes to give or receive gifts and is tech-savvy enough to shop online. But this model works especially well for wedding lists, christening lists, office leaving presents, but also common or garden birthday gifts or anything where users want to chip in together or collaborate. It has so far been pretty restricted by the Wrapp model of giving low-value gift cards that are essentially free to the user and offer a discount on product rather than a specific gift. 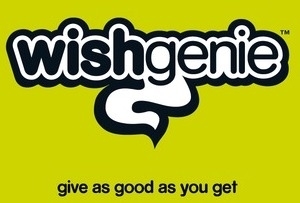 Wishgenie is the evolution of this gift card model, letting people collaborate and crowd-source the cash for a present. It also allows the featured retailers to benefit from incremental brand visibility and the peer-to-peer recommendations generated by users themselves. As with any new concept, it can be difficult to make people understand exactly how it works. Also, given the wide target market that Wishgenie's going for, it could be tough to get the focus on the right early adopters to help the brand grow virally. The payment model is essentially a super affiliate model, so scale will be extremely important to Wishgenie's success. Find out more about Wishgenie. Farhad Koodoruth is the founder of digital media agency Blowfish Digital.